Careful selection and installation of an evidence-based practice that begins initial implementation in a transformation zone will mitigate many of the most substantial implementation challenges. This chapter anticipates some of the more common implementation challenges and suggests strategies to address them and support program sustainability. 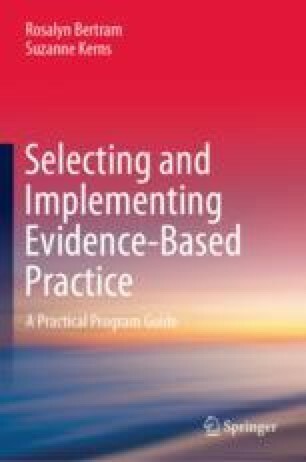 When well implemented, evidence-based practices can incur only marginal additional costs and, over time, produce significant community cost-benefits. This chapter examines the impact of initial perceptions of clinical progress and potential concerns related to cultural relevance as important considerations for new implementation efforts to address. Kerns, S. E. U., Levin, C., Leith, J., Carey, C., & Uomoto, A. (2016). Preliminary estimate of costs associated with implementing research and evidence-based practices for children and youth in Washington State (Report). University of Washington School of Medicine, Division of Public Behavioral Health and Justice Policy. Retrieved from https://www.hca.wa.gov/assets/program/ebt-cost-study-report.pdf.